A regular breeding resident and migrant; a regular winter resident particularly along the North Shore of Lake Superior and on the Lower Mississippi River. The Common Goldeneye was an uncommon species during the Minnesota Breeding Bird Atlas (MNBBA). Global in distribution, the Common Goldeneye can be found across the interior of Alaska and in Canada, Europe, and Asia. In North America, the southern limit of its breeding range is found in the northern Rockies, northern New England, and the northern Great Lakes region. Some of the highest breeding densities have been reported in northwestern Canada. Its distribution and relative abundance in southern Canada and the United States, as depicted by the federal Breeding Bird Survey (BBS), are shown in Figure 1. A game species, the Common Goldeneye was assigned a Moderately High Continental Priority by the North American Waterfowl Management Plan. Partners in Flight assigned it a Continental Concern Score of 11/20. A short- to medium-distance migrant that winters along the Alaska coast, through southern Canada, the United States, and into northern Mexico. A diving duck that feeds primarily on aquatic invertebrates (insects, mollusks, and crustaceans) and aquatic plants; small fish and frogs are occasionally consumed. A secondary-cavity nester; it will also use nest boxes. Breeding distribution and relative abundance of the Common Goldeneye in North America based on the federal Breeding Bird Survey from 2011 to 2015 (Sauer et al. 2017). Ever since Roberts wrote his account of the species’ status in Minnesota in 1932, the Common Goldeneye has been considered a breeding resident across the state’s northern forest region. He remarked that the birds were especially numerous “in the lakes and streams of Cook and Lake Counties, north of Lake Superior.” Surber, who visited the region in 1922, noted that goldeneyes were the most common duck in this region of the state. Indeed, “every lake and stretch of dead-water in the rivers [has] its quota of one to as many as half a dozen broods” (Roberts 1932). In those early years, the birds were also considered common a little farther west in northern Itasca County and in Itasca State Park. Confirmed nesting (nest with eggs) was only documented in Becker County (1883), but there were multiple reports of females with broods of small young from Cook, Itasca, and Lake Counties as well as from Leech Lake and Itasca State Park. Extremely tolerant of cold temperatures, Common Goldeneyes have always been a regular sight on large bodies of water that remain open during Minnesota’s cold winter months (Sayler and Afton 1981). At the turn of the century, such locales were Lake Superior, the Rainy River, and the Mississippi River from the Twin Cities south, including its major southern tributaries, such as the Cannon and Root Rivers (Roberts 1932). Little has changed in the intervening years since Roberts wrote his comprehensive account of the species. Green and Janssen (1975) reported goldeneyes could be found breeding across north- central and northeastern Minnesota. Densities, however, were highest in two north-central counties, Beltrami and Itasca. Janssen (1987) delineated 14 northern counties where breeding had been confirmed since 1970; Aitkin, Cass, and Crow Wing Counties established the southern boundary of its breeding range in the state; Becker and Roseau Counties established the western boundary. By 1998, when Hertzel and Janssen published an updated breeding distribution map, nothing had changed. Field staff with the Minnesota Biological Survey (MBS) reported 118 breeding season locations that were segregated into two major population centers: one in the northern regions of the Arrowhead region, and one in the central stretches of north-central Minnesota including Beltrami, Clearwater, Hubbard, and Itasca Counties. A few records were found farther south in Crow Wing, Morrison, and Otter Tail Counties (Minnesota Department of Natural Resources 2016). During the MNBBA, participants reported 472 Common Goldeneye records from 6.8% (322/4,746) of the surveyed atlas blocks and from 5.9% (138/2,337) of the priority blocks. Breeding was confirmed in a total of 142 (3.0%) of the surveyed blocks (Figures 2 and 3; Table 1). Once again, the observations were not evenly distributed across the northern counties but were divided into two major population centers. The first was located in the northern Arrowhead region and included all of Cook County and northern Lake and St. Louis Counties; the second was located in north-central Minnesota, where the majority of reports came from southern Beltrami, western Itasca, and northern Cass and Crow Wing Counties. Outside of these areas, other records were scattered near Lake of the Woods to the north, Pennington County to the west, and Kanabec County to the south. The absence of birds between these two population centers is largely a consequence of the heavily industrialized Iron Range, which stretches across central St. Louis County west to southern Itasca County. In total, Common Goldeneyes were observed in 18 of Minnesota’s 87 counties and were confirmed breeding in 16 counties. Breeding was confirmed as far south as northern Mille Lacs County. The atlas findings are similar not only to those of the MBS but also to the outcomes of earlier work by Zicus and Hennes (1988), who conducted an extensive survey of cavity-nesting waterfowl in the state using nest boxes. With the exception of a few records just beyond what was formerly considered the species’ breeding range, little has changed in the past 100 years. Elsewhere there appear to have been no major historical changes in the species’ breeding range apart from regional declines in abundance (Eadie et al. 1995). Goldeneyes are common throughout Ontario, and the province witnessed no major change in the species’ distribution between the first (1981–1985) and second (2001–2005) atlases (Cadman et al. 2007). The Common Goldeneye is a rare breeding species in northern Wisconsin (Cutright et al. 2006) and uncommon in Michigan, where reports are primarily limited to the Upper Peninsula and the very northern regions of the Lower Peninsula (Chartier et al. 2013). Breeding distribution of the Common Goldeneye in Minnesota based on the Breeding Bird Atlas (2009 – 2013). Summary statistics of observations by breeding status category for the Common Goldeneye in Minnesota based on all blocks (each 5 km x 5 km) surveyed during the Breeding Bird Atlas (2009-2013). Summary statistics for the Common Goldeneye observations by breeding status category for all blocks and priority blocks (each 5 km x 5 km) surveyed during the Minnesota Breeding Bird Atlas (2009-2013). Common Goldeneyes select a variety of wetlands, from large lakes and rivers to smaller ponds and streams that are embedded within forested habitats where there are suitable nest cavities. Because both coniferous and deciduous trees are used for nesting, wetland features are more important to habitat selection than the cover type of the surrounding forest. Many studies cite the goldeneye’s preference for clear, deep, oligotrophic lakes that vary in size from 1 to 20 hectares (Figure 4). Stands of emergent and submerged vegetation are usually limited (Eadie et al. 1995). Extensive field studies in Minnesota, however, demonstrated a much wider range of habitats, including small ponds (16 ha) with extensive stands of bulrush and pondweeds as well as large lakes (100 to 1,250 ha), some with extensive stands of emergent wetland vegetation and some with absolutely none (Zicus et al. 1995). The most important feature influencing habitat selection may be the abundance of aquatic invertebrates. Because fish also compete for these prey items, goldeneyes are frequently found on fishless lakes. Yet, in Minnesota, high breeding densities were observed on lakes with highly productive fish populations (Zicus et al. 1995). Fishless lakes may simply be preferred when they are available (Eadie et al. 1995). Typical breeding habitat of the Common Goldeneye in Minnesota (© Deborah Petersen). As for other waterfowl restricted primarily to Canada’s boreal region, the Waterfowl Breeding and Habitat Survey conducted by the U.S. Fish and Wildlife Service and the Canadian Wildlife Service does not cover the full breeding range of the Common Goldeneye, particularly in western Canada. Data collected by the survey is further compromised by the fact that biologists cannot distinguish between the Common Goldeneye and Barrow’s Goldeneye from the air. The latter has a much smaller breeding range than the Common Goldeneye, being restricted largely to the Pacific Northwest, western Canada and Alaska, and southern Quebec. Although the majority of birds encountered are Common Goldeneyes, a precise estimate of the ratio of Common Goldeneyes to Barrow’s Goldeneyes is not available. So, with the data subject to these caveats, in 2015, the Waterfowl Breeding and Habitat Survey reported a combined total of 988,043 goldeneyes in the Traditional Survey Area and the Eastern Survey Area (U.S. Fish and Wildlife Service 2016). This number is down from the 2004 population estimate of 1.35 million Common Goldeneyes estimated by the North American Waterfowl Management Plan (2004). Other long-term surveys also provide some value in assessing the trends of the Common Goldeneye. The federal Breeding Bird Survey, which does not cover the northernmost regions of the species’ range, shows a relatively stable population from 1966 to 2015 (Sauer et al. 2017). 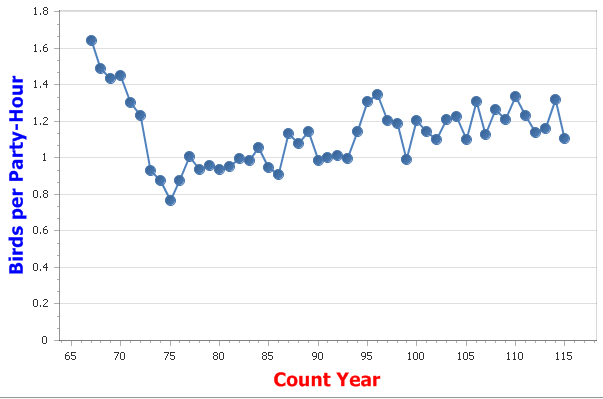 Data collected by National Audubon’s Christmas Bird Count during the same time interval shows an initial drop in the early 1970s but, again, a relatively stable to slightly increasing population since then (Figure 5). The Minnesota Waterfowl Survey is not conducted statewide but focuses instead on regions with a high density of lake basins, excluding the more infertile lakes in northeastern counties. Thus, the survey covers only a portion of the Goldeneye’s Minnesota range, which is centered in northern Cass County. In this region, population numbers have fluctuated widely (Cordts 2015). The 10-year average from 2006 to 2015 was 1,375 birds, down from the previous 10-year average (1996–2005) of 1,962 birds (Figure 6). Throughout their breeding range, population densities vary widely. Estimates across Canada range from approximately 0.08 nesting pair per km2 in the western and central provinces to 0.02-0.19 nesting pair per km2 in the eastern provinces (Eadie et al. 1995). In Minnesota, data from 1980 to 1985 show densities averaging 0.5 to 3.5 pairs per km of shoreline (unpublished data provided to Eadie et al. 1995 by M.C. Zicus). When local populations experience a decline due to conditions on the breeding or wintering range, recovery can be slow given that birds usually do not breed until their second year and when nesting attempts fail, the birds rarely renest that same year. Overall, availability of nest cavities may be the most important factor regulating population numbers (Eadie et al. 1995). Common Goldeneye numbers reported on the annual Christmas Bird Count in North America from 1966-2015 (National Audubon Society 2016). Common Goldeneye numbers reported during the Minnesota Waterfowl Survey, 1987–2015 (data not corrected for visibility; taken from data presented in Cordts 2015). At the continental scale, the North American Waterfowl Management Plan (2004) has categorized the Common Goldeneye as a species of Moderately High Concern. Partners in Flight (2017) has also assigned it a moderate Continental Concern Score of 11/20. Both goldeneye species (Common and Barrow’s) comprised less than 1 percent of the total duck harvest in the United States (60,614 birds) in 2015; harvest statistics for the two species are always combined. Only 3,777 Common Goldeneyes were harvested in Minnesota in 2015 (Raftovich et al. 2016). Approximately 41% of the U.S. harvest occurred in the Mississippi Flyway. As for other forest species, the sustainability of Common Goldeneye populations is closely tied to the long-term health of the boreal forest region, where nearly 83% of the population resides (Boreal Songbird Initiative 2016). Industrialization and climate change are the most significant threats to this region. Industrialization eliminates and degrades forest habitat, which can have a direct negative impact. However, one consequence of industrialization, acid precipitation, may actually provide short-term benefits to goldeneyes. Acid precipitation reduces fish populations, presumably making lakes more suitable to the goldeneye because fewer fish are competing for the aquatic invertebrates that goldeneye feed upon. A study north of Sudbury, Ontario, demonstrated that female goldeneyes nesting in fishless, acidic lakes invested more energy in their clutches (greater egg mass) than goldeneyes nesting in lakes with high fish productivity. The birds responded positively to an indicator of high habitat suitability (i.e. the absence of fish), even though acidic lakes may have long-term, negative impacts to the population “through chronic, sublethal effects on physiology and survival” (Mallory et al. 1994). The availability of suitable nest cavities may also be a primary limiting factor for the population (Eadie et al. 1995). Although lake quality may be more significant to goldeneyes’ habitat selection, good forest management practices that retain mature trees and snags, especially in riparian areas, are essential for nesting females. Contaminants in coastal wintering habitats and in summer nesting habitats also pose a concern. A 1981 study in Minnesota detected DDT, PCBs and mercury in eggs collected from goldeneye clutches; the eggs also exhibited thin shells (Zicus and Hennes 1988). Known to many as the “Whistler,” a name earned by the whistling sound made by its rapid wing beat, the Common Goldeneye appears to have a relatively stable future in Minnesota in the near term. Like that of so many boreal nesting species, however, its future may depend less on how northern forests are managed than on how the impacts of a warming climate are addressed. Mallory, Mark L., Donald K. McNicol, and Patrick J. Weatherhead. 1994. “Habitat Quality and Reproductive Effort of Common Goldeneyes Nesting Near Sudbury, Canada.” Journal of Wildlife Management 58: 552–560. Sayler, Rodney D., and Alan D. Afton. 1981. “Ecological Aspects of Common Goldeneyes Bucephala clangula Wintering on the Upper Mississippi River.” Ornis Scandinavica 12: 99–108. Zicus, Michael C., and Steven K. Hennes. 1988. “Cavity Nesting Waterfowl in Minnesota.” Wildfowl 39: 115–123. Zicus, Michael C., Steven K. Hennes, and Michael R. Riggs. 1995. 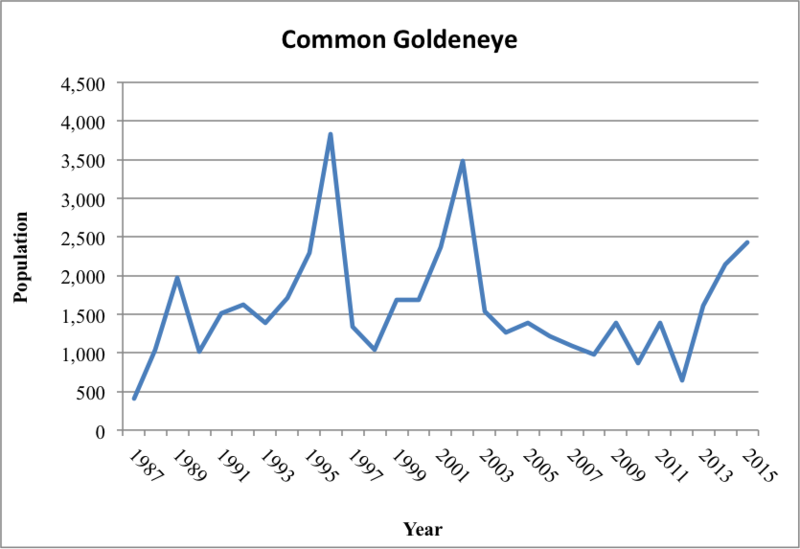 “Common Goldeneye Nest Attendance Patterns.” Condor 97: 461–472.